Baked Chicken Nuggets are a must make for any busy family. These BAKED EXTRA CRISPY PARMESAN CHICKEN NUGGETS will blow your mind and become an instant family favorite. Made healthier by baking instead of frying, you'll never miss the grease. 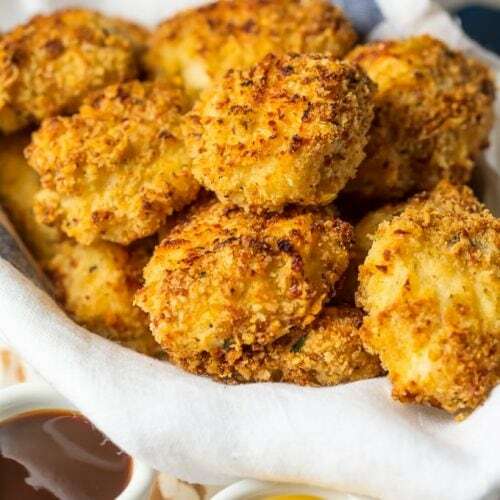 Kids and adults will be requesting these flavorful Homemade Chicken Nuggets again and again! Heat oven to 400°F. Cover a rimmed cooking sheet with foil and spray the foil with nonstick cooking spray. Place a wire rack on the cooking sheet, and spray it lightly with nonstick cooking spray. Pat the chicken dry, cut it into 1½-inch pieces and place it in a medium bowl. Sprinkle the chicken with ½ teaspoon salt, ½ teaspoon freshly ground black pepper, and add the buttermilk. Mix to coat all the chicken pieces. Set aside. In a shallow dish, combine breadcrumbs, Parmesan and herbs. Mix to combine. Place flour, butter and eggs in separate shallow dishes. There will be 4 dipping dishes in total. Strain the chicken/buttermilk over a mesh strainer with a bowl underneath. Line up the dipping dishes; chicken, flour, butter/egg mixture, breadcrumb mixture. Dredge a chicken piece with flour and shake off any excess. Dip it in the butter/egg mixture and then the breadcrumb mixture. Place it on the wire rack. Repeat until all chicken has been coated. Place cooking sheet on the middle rack in the oven. Bake 20-30 minutes, turning after 10-15 minutes. Nuggets are done when golden brown, crispy and cooked through. If nuggets aren't as crispy as you want after 30 minutes, Set the oven to broil and cook a few minutes until desired crispiness. Serve hot with dipping sauces.